Our Denim unit presently produces more than 12 million meters per annum. Our product range comprises of 100% cotton and blended denims, which are detailed below. 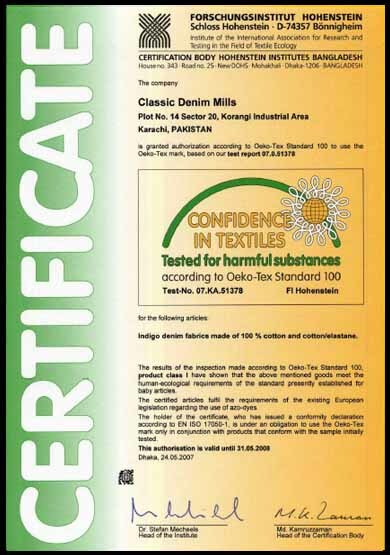 We have enforced rigid quality standards in each and every stage of production to ensure best fabric for the customer. We are adhering to international recognized quality checking ASQC (American Society of quality control) system, which is called ‘four’ point system, during inspection so as to reduce wastage, rejection and increased productivity at the garmenting stage..
And any other special types according to customers’ specific requirements. The consultants and experts, who are involved, have been chosen from the best in the industry and are spearheading the revolution in the denim industry. Our mill is located in the prime Industrial Area of Pakistan, which is known for its best produce of textile products Our mill is well accessible by all the major communication and road links nationally and internationally. We are equipped with latest and sophisticated machineries and expertise in each and every field to cater for our customers satisfaction.